Our family has operated Peace Farm since 1950. Rita and I introduced honey bee colonies in 2003, and family members produced honey and bee hive products. As we gained knowledge of bees and beekeeping, all members of the family participated in various aspects of tending to bees and producing and selling hive products and bee colonies. Along the way, several of us, trained as educators, became increasingly involved in beekeeping education. Tod Underhill helped me set up the Peace Bee Farmer blog, suggesting that I write down my ideas from time to time. 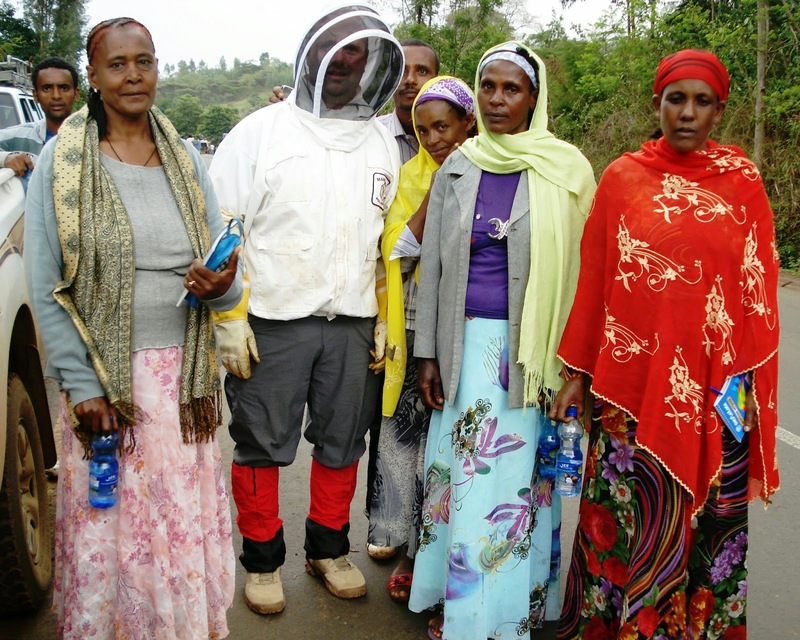 That’s Tod in today’s photo, pictured in Ethiopia with farmers he instructed in beekeeping. The Peace Bee Farmer blog resulted from my effort to document the bee forage plants on Peace Bee Farm as they came into bloom throughout the year. I had no idea that the writings would become so widely read or that they would put me into contact with so many individuals around the world. The simple writings and photos followed requests to give others a view of honey bees, their life inside the hive, our beekeeping efforts, and people we encounter. I have posted writings on the internet about beekeeping and matters of agriculture and the environment for six years. The Peace Bee Farmer pieces have been accessed at least one million times from two hundred countries. The resulting interactions lead to many valued contacts and friendships in many parts of the US and around the world. With today’s internet, people, anywhere on earth, may find the blog by typing a key word, such as “varroa,” or “beeswax,” or “peace.” In recent years, I noticed that increasingly often individuals accessing the blog from locations in the world’s least peaceful locations. While many find the writings by searching for beekeeping or environmental issues, some happen upon the website while searching for peace efforts. Regardless of how you came in contact with the Underhill family that operates Peace Bee Farm, we sincerely wish peace be with you. 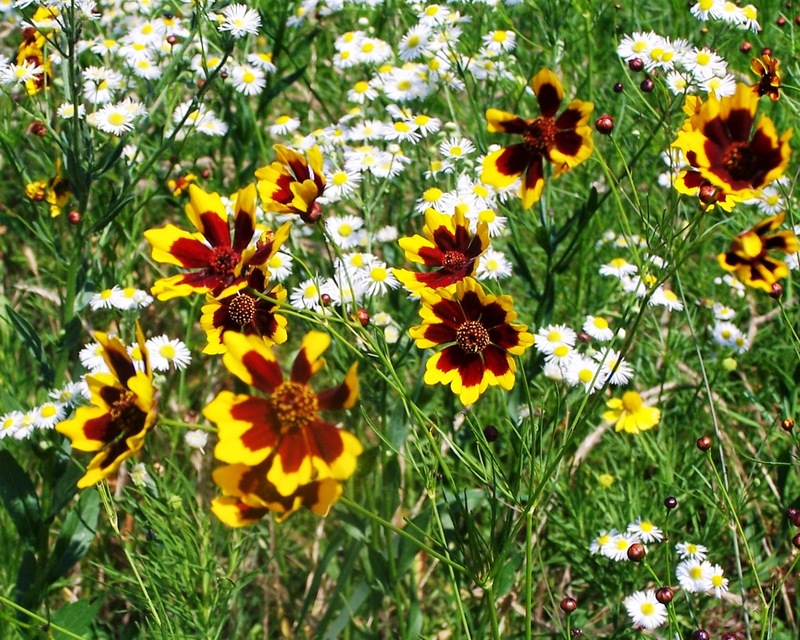 Dr. Spivak and Mr. Mader suggested that a solution to the loss of bee habitat could be conversion of mowed and sprayed areas along the nation’s highways into bee corridors. Corridors connect our pollinator gardens and pastures, making them much more effective habitats. Planted with native wildflowers, these right-of-ways could well serve our honey bees, native pollinators, birds, and small mammals. The future will see an interest in moving to roadside vegetation management plans to support our pollinators while beautifying our roadways. 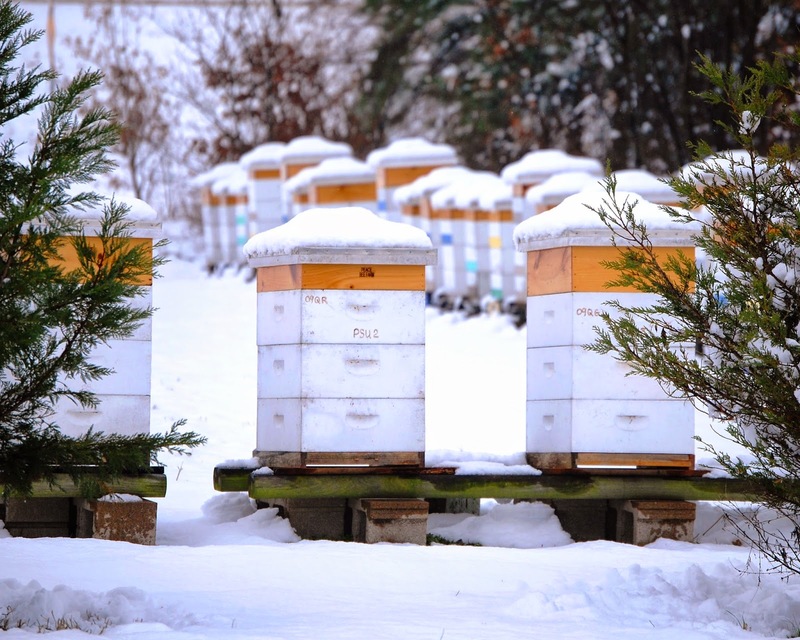 The success of the colony to survive the winter is largely dependent upon the health of the bees in the fall and the beekeeper’s efforts in setting up the hive for winter. Fall is a time of transition in the bee hive. The bee colony’s population is changing from the short-lived bees of summer to the longer-lived bees that live through the winter. Bees born in the early fall are the ones that will produce the brood food for the first bees the colony rears the following year. Food stores are important. Bees must be able to sustain themselves until flowers bloom again in the spring. The bees store food of both honey and pollen in cells in the bee hive. Other necessary nutrients for the colony’s survival are stored in fat bodies in the individual bees’ abdomens. The more food that bees have available in the fall, the more nutrients they store in these fat bodies. These bees with well-filled fat bodies are best able to produce brood food for bees reared before flowers start blooming in the spring. The health of the bees is important for the survival of the colony through the winter. If a large number of the colony’s bees are afflicted by viruses spread by parasitic mites or by Nosema disease, many bees will likely die over winter. Hives losing excessive bees often do not have enough bees to maintain a warm environment in the winter cluster. In preparing the hive in the fall, the beekeeper needs to check for the presence of bee parasites. If Varroa mite loads are high, the colony will not survive for very long. Reducing Small Hive Beetle levels to a minimum in the fall helps control these pests in the following year. The winter bee hive must also be provided with adequate ventilation to prevent the warm, moist air from condensing inside the hive and dripping water on the clustered bees. 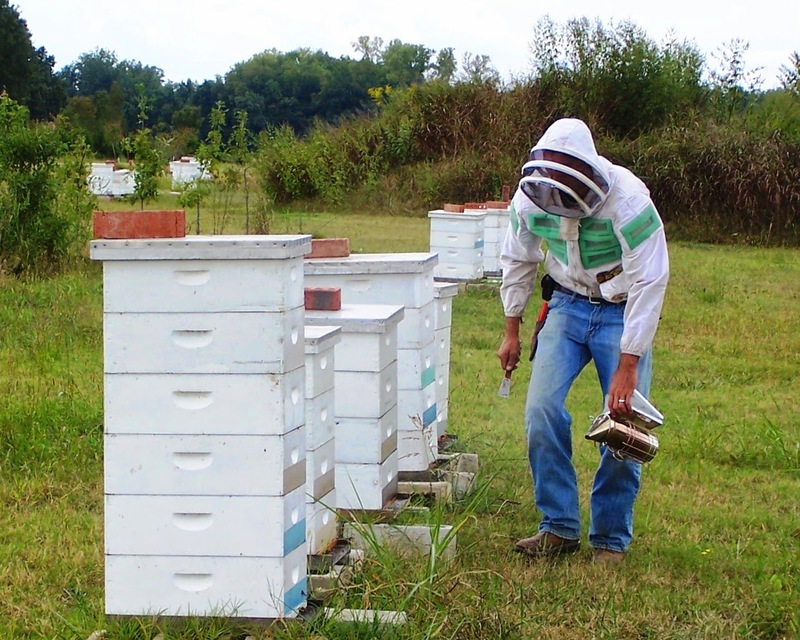 Today’s photo: Jeremy Bemis prepares hives for winter.